The aim of communication is to change the way people think and act. It must therefore be feasible for the participants to carry out the recommendations you are giving them. You will need to check whether services are available to people before you advise them how to seek treatment. Here is an example of how all the information you have collected in the preparatory stages can be developed into messages appropriate to the stakeholders or target people. Rabies Kills! Prevent Rabies! Take animals to get vaccinated. Avoid dog bites. Wash bite wounds with soap and water. Get medical care immediately after a bite. Perceptions: “Take animals to get vaccinated” will not be effective if people do not believe vaccination or medical treatment of animals is necessary. 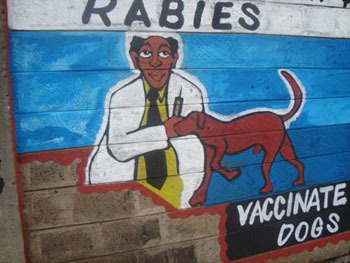 POSSIBLE SOLUTION: Communication may need to focus on why vaccinating dogs is the most effective way to prevent rabies in humans, particularly children. Cultural: The role of dogs can vary. In some localities, dogs are viewed as pets, where in others, they are seen as guard dogs. When this message was tested in Asia, “Take animals to get vaccinated” raised the issue of who should vaccinate the dogs (as many are not “owned” as pets). POSSIBLE SOLUTION: Find out more about how dog populations are managed in the area, and focus messages on the basis of the information you gather. Economic: Some people may not be able to afford to pay for vaccination for dogs or post-exposure vaccinations. “Get medical care immediately after a bite” may therefore not be feasible in some cases. POSSIBLE SOLUTIONS: Initial messages can focus on ways of avoiding bites or limiting damage as much as possible. First aid messages such as “Wash bite wounds with soap and water” may need to be prioritised. Understanding why treatment is important can help people make decisions. In some cases, people may be able to scrape together the money for treatment from some source, but prefer to spend this money on something they consider more important, perhaps treatment for another disease. It is important not to alarm people, and to find positive ways of communicating this information, but if they understand how the treatment saves lives, it can help them prioritise competing demands on their resources. Ideally, data indicating that people cannot afford treatment should prompt consultation towards measures on how these barriers can be overcome. Referring back to your initial stakeholder analysis from stage 2 can help involve a broad cross-section of community participants in identifying workable solutions, for example, by bringing them together in structured workshops aimed at developing ways forward. Physical: In addition to whether or not they can easily access healthcare facilities, some populations may not have access to clean water. 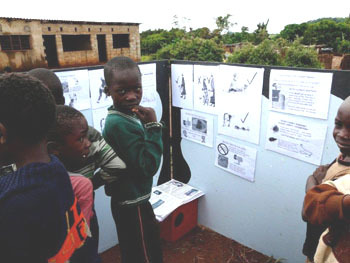 The message: “Wash bite wounds with soap and water” raised questions when it was tested in localities with limited clean water and soap. POSSIBLE SOLUTION: it may be important to expand the message to say that washing a bite wound from a potentially rabid animal is advisable, even if the water is not clean, and that any attempt to wash out the virus just after the bite can help save lives. It might help to show a diagram of how the virus travels through the central nervous system to the brain. Again, the more people understand about why, the more it helps them to make important decisions. How do I formulate messages? The best way to write the messages is to involve representatives from the primary, secondary and tertiary participant groups you identified in 4.2.3. For example, if the aim is to make children more aware, parents, older teenagers or teachers can help. Here, again, you can draw on your initial stakeholder analysis, to identify other people who may be able to help. Collaboration may take the form of a workshop, for instance. Click here for an example of a workshop format that can help develop messages and media for delivery. If it is not possible to develop the messages in collaboration, they should at least be tested on representatives from these groups, to ensure they will be understood as you intend, and to maximise the chances of changing the way they think and act. However, testing messages should not be used as an automatic substitute for getting to know your target community and collaborating with them in the preparatory stages. In which language(s) will your target group best understand the message? If possible, develop the message in these languages, rather than translating it from a stock message. It will make it more relevant to the participants. For example, a slogan may sound very catchy in one language, but mean nothing in another. Is all your target population likely to be able to read? Even if they are, clear images can reinforce the message, but they should be clear and appropriate to the culture, and should be obtained from – or at least tested on – the target population. Images indicating behaviour can be reinforced even further by ticks and crosses, showing how and how not to do things correctly. Colours may mean specific things in different cultures (e.g. red for “no” or “danger”). Do not use technical, scientific terms. Make sure your messages use words the general public (and especially children) will understand. Use short, clear sentences or phrases, make sure they are not ambiguous and try to minimise the chances of them being understood in a different way.